Or I wish, ahaha (seems like the one above is Yves Rodier’s?). Anyway, there’s a Tintin: Hergé’s Masterpiece (let me just copy-paste that, don’t want to type the é myself) exhibition held in Somerset House commemorating the publishing of Tintin: Hergé’s Masterpiece book. It’s being held between 12 November 2015 – 31 January 2016, but me being me, just known from my friend S about it (which was in Indonesia but know more about it than me. Hey S, if you’re reading this, holler please. Thank you for the Tintin hardbound! ), then realised that the exhibition’s only until the end of January in last week of January, visited the exhibition on the same day. Fortunately, the exhibition’s not that big, I was afraid I couldn’t have enough time to catch my train if it’s pretty big. I….’m actually quite a fan of Tintin! Looking through the images and the strips on the exhibition, I could guess from which book the images mostly were. There’re a few exhibition-passerbies (what to call them? Haha.) murmuring nearby Marlinspike’s Hall miniature, not knowing what it was (Tintin’s house was technically correct, but it’s not Tintin’s house, you know), made me so itchy to correct and being a know-it-all, fortunately I relented. Talking about Tintin, I actually read the series when I was in elementary school. I have five of them at home, secondhand from one of my aunts (maybe, I didn’t really know where they were from), fallen-apart stitch-binding and a bit perforated. Other than those five, I borrowed the rest from a book rental nearby my Grandparents’ house (and in extent, my mother’s office. Disney was the name). They’re the five on the second row of this Tintin booklist below. Maybe that’s why the Red Rackham treasure arc was one of my favourites. 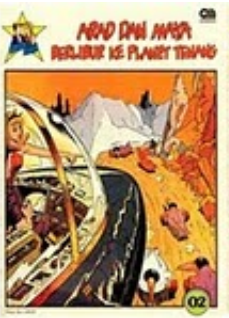 Quite far after, there’s a Tintin animated series too (The Adventure of Tintin. It’s produced in 1991, for real? What?). I think it’s when I was in junior high, I had a few of it in VCD format, the ones that I remember are The Black Island, The Blue Lotus and Flight 714. I believe I have some more but I forget which ones. This makes me feel nostalgic. Ooh, I’m old. You couldn’t actually find Tintin and other Franco-bBelgiumcomics in Toga Mas in Affandi Street! I didn’t expect it, was it because it’s very popular or the opposite? I only found one English version in Gramedia (IDR 100.000 too, which’s outside my expected price range that time.). Fortunately I searched in Toga Mas Kota Baru, nearby my old junior and senior high. There’s a 25% comic discount day there on Tuesday(?) too, if only I knew beforehand. I was there on Wednesday. Alas, their departure’s looming and there’re Tintin and Smurf comics on the racks, so they’re enough for me (and Toga Mas’ 15% discount’s not bad either. No, this post isn’t sponsored). But, they’re two different versions of Tintin there! There’re the big ones and the small ones. Memory about which one and which size I bought was pretty blur. I remembered that I was contemplating on buying Destination Moon and The Shooting Star and seemed like I bought them the small ones (about IDR 30.000 in price?). I actually wanted to buy one of them at least Flight 714 because there’s Jakarta (Kemayoran old airport), but there’re actually only about 4 Tintin books there, both big and small, and no Flight 714. 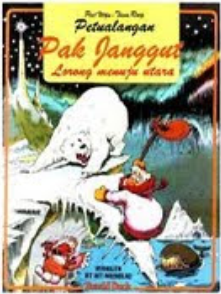 Snippet of Bahasa Indonesia in Tintin comic in Soewandi spelling. They’re talking about adding sambal ulek to recipe. 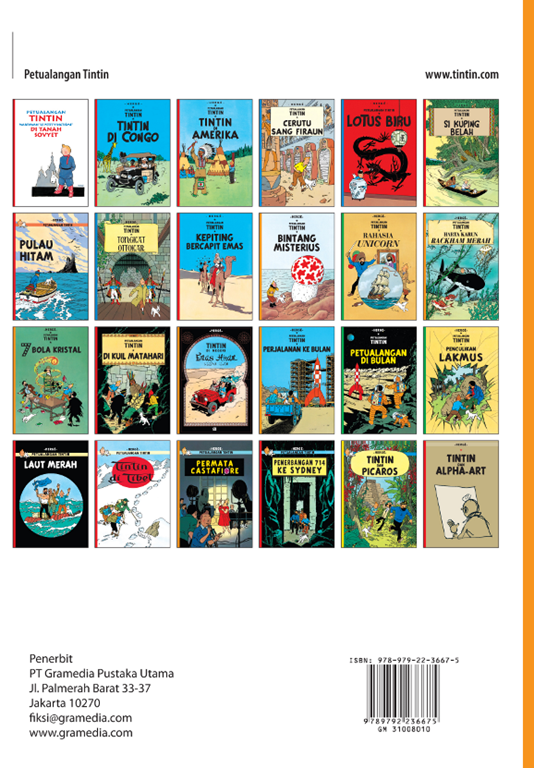 Both of the Tintin sizes I encountered in Toga Mas are published by Gramedia, which is one of the largest publishing houses in Indonesia. Apparently the smaller ones (about 22 cm, there other ones are 29.5 cm) are the third printing by Gramedia and the small size was requested by the original publisher, Casterman. The old ones I read were published by Indira. They’re actually pretty rare nowadays, and usually being sold as collectibles. If I knew this back then, I would have collected them all and put them inside laminated plastics, ahaha. There’s actually a first publisher before Indira named Tiga Lima. 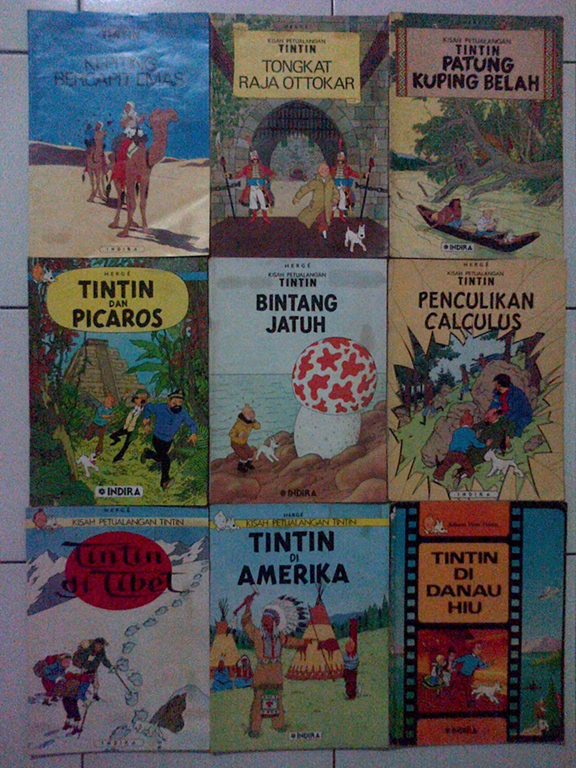 I never seen any of these Tintin comics, and it seems like it’s quite a mystery for Indonesian Tintinologist too. Apparently there’s a fire tragedy in Indira, and all the master plates of Tintin there were burnt, resulting in their 2005 edition of Tintin’s quality worsen. The publishing house was also closed in 2006. RIP Indira, without you (and Bobo magazine, of course. Maybe I’ll write about Deni the Fishman – Fishboy: Denizen of the Deep and Mr. Beard – Douwe Dabbert later) I won’t know all those European comics today. 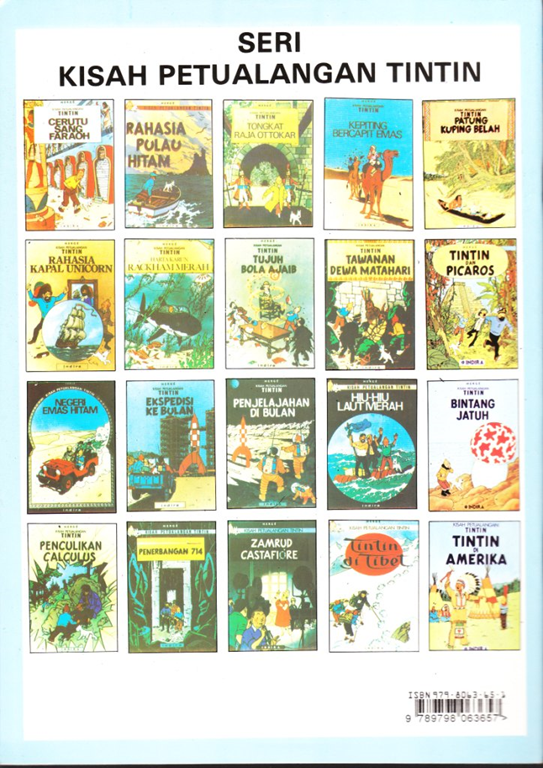 There are actually a lot of differences from the Tintin published by Gramedia today and the one I’m familiar with. The most obvious! are! the names! The Indira version used the English version of the names. So, I’m most familiar with Snowy, Thompson and Thomson, and Prof. Calculus. The one Gramedia published nowadays uses their original names, and Prof Lakmus (which seems like Indonesian original? 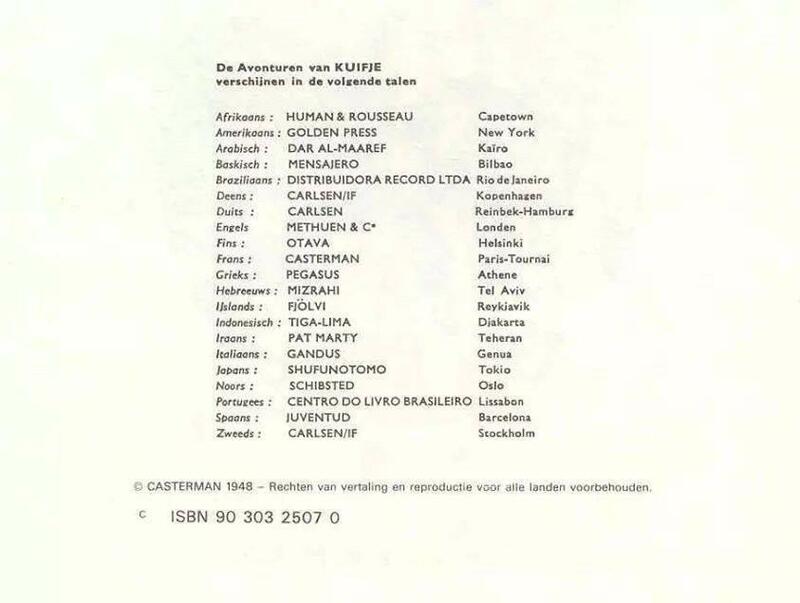 Wow, it’s pretty rare to have Indonesian-ised name, I feel quite proud, I don’t know why). Gramedia also changes a few of the titles, “Flight 714” becomes “Flight 714 to Sydney” and “Tintin and The Shooting Star” becomes “Tintin and The Mysterious Star”, for example. It’s obvious that “Calculus’ Kidnapping” would be changed to “Lakmus’ Kidnapping” too. Back then the price was in IDR 675 (1975) – IDR 1200 (after) range (Wow!) now it’s about IDR 40.000 (2008) -IDR 100.000 (2014’s Tintin in the Soviet). Indira also didn’t publish Tintin and the Alph-Art, so I had just read it quite later when I was in high-school and rereading Tintin online. More of this is in this article (in Indonesian). If you like Tintin and want to buy more than just books and VCDs/DVDs, you can visit the Tintin Shop (if you’re in London proximity though). There’s one in Covent Garden. If you aren’t nearby, you can just shout WANT together with me by visiting its website. There’s also a Tintin Shop back when I was visiting Singapore, so maybe that one’s nearer. Anyway, lots and lots of my posts are becoming a Nostalgia Filter post nowadays, so the series are seen mostly by rose-coloured glasses. 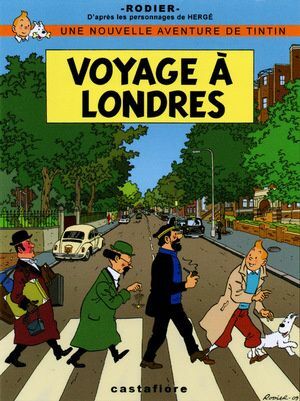 But, even with all its pluses and minuses, I really suggest people read and watch Tintin! Not only the movie version but the original ones as well. 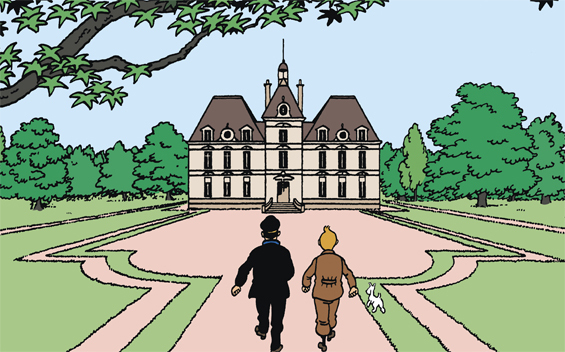 Also, there’s this Tintin TV Trope page if you’re interested. Posted on February 6, 2016, in Reading, Travelling and tagged exhibition, gramedia, indira, london, museum, nostalgia filter, nostalgic, Reading, somerset, tintin, traveling. Bookmark the permalink. Leave a comment.